Motorcycle accidents happen far too often in states all across the country, and Delaware is no exception. Nearly 5,000 motorcyclists died in crashes in the United States in 2016 alone—15 of them right here in Delaware—according to the Insurance Institute for Highway Safety (IIHS) and the Delaware Office of Highway Safety (OHS). One of the most heartbreaking things about motorcycle accidents that result in lost or forever-altered lives is that the vast majority of them could have been prevented. Many, if not all, motorcycle crashes are caused by negligence—whether on the part of a motorist, motorcyclist, or other responsible party. 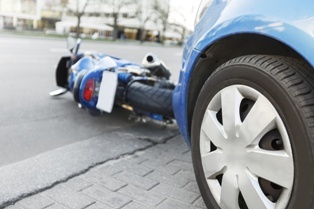 While some people might assume that motorcyclists are the primary cause of motorcyclist crashes, research shows that isn't the case; when motorcycles and passenger vehicles collide, the motorist is to blame an estimated 60 percent of the time. Speeding. Driving over the posted speed limit—or too fast for the current road or weather conditions—can endanger everyone on the road. Speeding is a common factor in many types of motor vehicle accidents and played a role in more than 33 percent of fatal motorcycle accidents in 2016. Driving under the influence. Substances like alcohol, illicit drugs, or powerful prescription medications can impair a motorist's judgment, reaction time, and ability to drive safely. In 2016, alcohol was a leading factor in fatal motorcycle crashes. Unsafe lane changes. Because they have smaller profiles, motorcycles can easily hide in a passenger vehicle's blind spots. Motorists who fail to signal or check their blind spots before changing lanes are at risk of causing a serious accident. Lane splitting. Many motorists aren't used to watching for motorcycles and, even when they are watching, they often expect motorcycles to maneuver like passenger vehicles. Motorists don't expect to see vehicles driving between lanes of traffic and, as a result, don't always look for motorcycles that might be doing so. Car door collisions. Motorists also often forget to check for motorcyclists when opening the doors of a parked vehicle. When a driver opens their door into the path of an oncoming motorcycle, the motorcyclists can be thrown and sustain severe injuries. Inexperienced motorists. Novice drivers are even less likely to watch for motorcyclists than drivers with more experience behind the wheel. Hurt in a Delaware motorcycle accident caused by someone else's negligence, and buried under a mountain of medical bills? The knowledgeable personal injury attorneys with the Morris James Personal Injury Group can help you fight for whatever compensation you're owed. Contact us today to schedule an appointment for a free initial case consultation.